Designed in 1980, the IWC Porsche Design Ref. 3509 was made specially for the then West German Military, or Bundeswehr. The Bundeswehr requested that a series of watches be made for three groups of Navy divers each with special requirements. The Ref. 3314 & 3319 were made for the combat swimmers and the Ref. 3519 was made for mine divers whose watches had to be completely anti-magnetic as to avoid disturbing sensitive magnetic fields around mines which could cause them to detonate. The reference 3509 in question was designed for attack divers, highly trained navy soldiers whose training focused on defending and attacking military targets both in and underwater. It is a testament to IWC as you consider whilst this was the last watch made specifically for the military, it was still in active service as of 2009 after nearly thirty years. Regardless of whether you like the design of this piece or not, you must admit it has a certain wow factor to it. Whilst it's clear the crown is at four o'clock there is something about it's placement along the rounded case that makes it almost invisible upon first inspection. Looking at this watch I think it's crownless, even though I know it's not! This piece has what is known as the "plain dial" which uses "nachleuchtend" materials made up of Zinc Sulphide which glow when illuminated under white light. The alternative H3 dial used tritium instead of Zinc Sulphide and had a red "H3" symbol at 2 o'clock on the dial. The movement inside this piece is the IWC Calibre 3752 which is a heavily modified ETA 2892. Some may turn their noses up at the ETA base but realistically anything that has been modified and deemed to meet the standards of the German military must be good. Overall this piece is in great condition with the original dial and hands on the watch with the original box and bracelet tool offered as well. There are some scratches across the bezel but if you just imagine they occured during a nighttime raid on a submarine then they seem a lot cooler. Being a military issued watch this piece certainly has seen some exciting times and has more than a few stories to tell. If it did tell you of course then it would probably have to kill you. The auction estimate for this piece is 5000 to 6000 GBP. With only ever 1120 examples of the Polaris II ever made, no-one is complaining about an overabundance of used pieces. The two most common models are the turquoise dial made for the American market and the grey GT dial for the European. The third alternative, the Oxblood, is the most sought after with a piece selling at Christies last year for over two thousand pounds more than the current auction estimate on this piece. The deep Oxblood coloring might not be to everyone's taste but I think it certainly is striking, especially when you consider how frequently red colors fade over time to orange or even white. Having such a rich color after nearly forty five years is very impressive. I will say from what I've seen online and from the auction photographs I feel the bracelet is far too narrow compared to the case size, but perhaps it is something that sits better on the wrist than off. The Polaris II is held in very high regard due to it being the first Jaeger LeCoultre alarm watch with a date and 360 rotation of the rotor as opposed to the bumper movements of its predecessors. 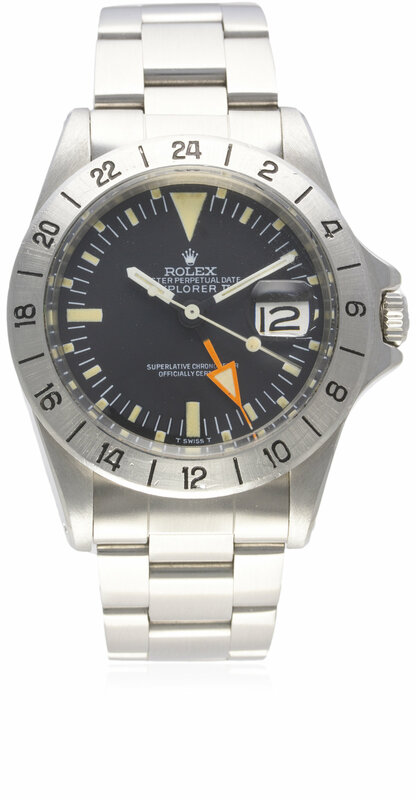 However it's probably not the first watch that comes to mind when you think of Memovox which could be the first offering of dress pieces, the classic Deep Sea or perhaps even the first Polaris. Consider how that Goodwill Deep sea was sold to a collector for $35,000 and how the estimate for this piece is at least seven times less. 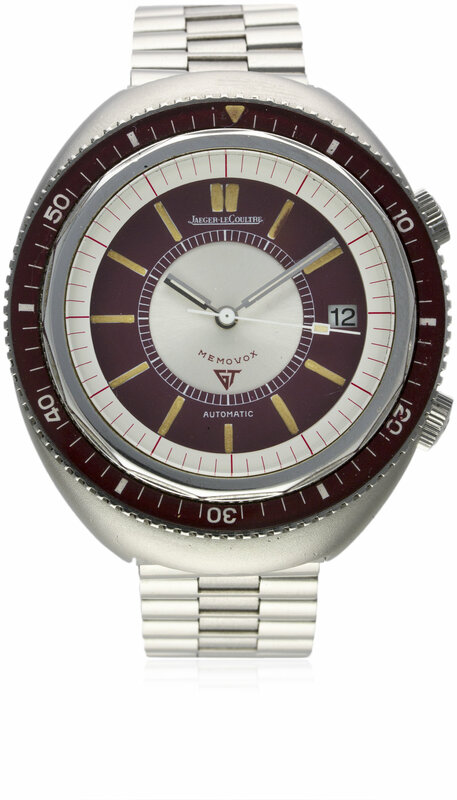 This is a great opportunity to score a classic watch. The auction estimate for this piece is 4500 to 5500 GBP. Oh Boy. This one is a biggie. Not only is this a tourbillon wristwatch by the first manufacturer to put a tourbillon in a wristwatch, but it's also the first central tourbillon in a wrist watch. For those that are unaware of what an accomplishment that it you have to consider the history of the tourbillon which was invented in 1794 by Abraham Breguet (Yes that Breguet) to counteract the effect of gravity on a pocket watch. For the most part pocket watches would spend most of their day sat vertically during which gravity would begin to "pull" on the balance wheel/spring causing timing irregularities. By placing the balance wheel, balance spring and escapement in a cage and then rotating that cage 360 degrees a minute, it would allow these irregularities to average out over time. Now how useful a tourbillon is in a wristwatch is debatable as the wrist changes position more frequently than a pocket does thus the need to adjust for gravity is perhaps negligible. Regardless of efficiency though a tourbillon is a masterclass in horological workmanship especially when placed in the center of a wristwatch and also acting as a seconds hand as well. 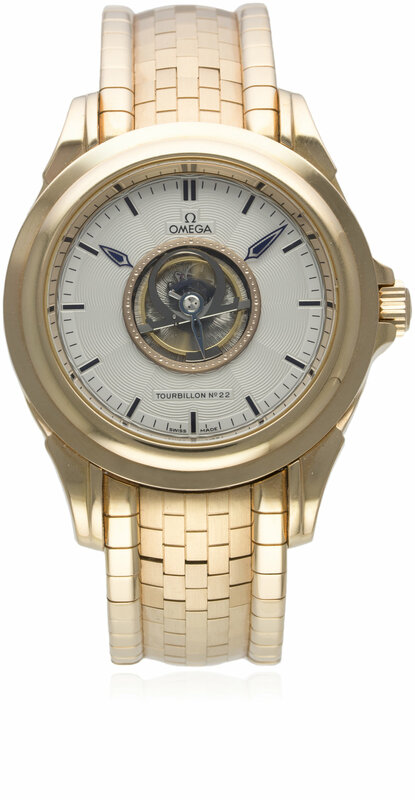 With the central tourbillon emblazoned with an Omega logo acting as a seconds hand it begs the questions as to how to attach the minute and hour hands if the traditional center position is taken up. Upon closer inspection you can see that the minute and hour hand are actually painted upon two thin sheets of sapphire crystal which are rotated and give the illusion that the hands are floating. Whilst in other watches/clocks such as the Cartier mystery clock this would be the main focus, it's just a side note to the tremendous central tourbillon. Beneath the crystal the hand finished dial is engraved with a repeating Geneve wave pattern. Something that you might not be aware of this piece is that there are actually two crowns with the traditional 3 o'clock crown used only to wind the watch and another on the caseback used to set the piece. As can usually be found on some Omegas, there is an engraving of Chrono the Greek God of time found on the case back as well. Strangely enough, despite the inaccurate association with Steve McQueen, this piece was not very popular at launch as critics found the dial cluttered and illegible. This is odd considering the steps Rolex took to make it more legible in the first place by placing lume markers every 2 1/2 minutes apart to make reading the 24 hour hand easier. Why would you need to know whether it was 10 in the morning or 10 at night when you could just as easily look outside? Well this piece was originally designed with cave divers in mind who might spend days underground where losing track of the day/night schedule is very easy. It's ironic that at the moment this is probably one of my most loved watches and it was designed with spelunkers in mind yet I'm terrified of getting trapped in small enclosed spaces. Funny how these things turn out in life. This particular model features what I believe to be the Mark II bezel due to it's pronounced numbering and centered alignment as the earlier Mark I bezel had its numbers a lot closer to the plexiglass. I believe that the dial on this piece is also a Mark II however I'm only going from the lot photos and could well be wrong. What I am sure of is how vivid that 24 hour hand is! It's very common to see these hands faded away to either a dull orange, yellow or even white in some cases so it's good to see it with such a bright pop remaining. The El Primero Chronograph movement is perhaps the most well known in-house chronograph movement ever made and was the first movement ever to run at a staggeringly fast 36,000 oscillations per hour. The Ref. A385 was part of the original line up of three El Primero chronographs released in 1969, the A384 and the classic A386. It's funny to think that if not for one insubordinate watchmaker,the El Primero could have been resigned to history forever. Just six years after the release of the El Primero movement, the Zenith Radio Corporation who had bought Zenith decided that more focus should be placed on developing quartz movements and ordered that the machines, tools and parts related to producing the El Primero movement be sold as scrap. Mr Charles Vermot, a foreman in Workshop 4 at Le Locle, who had been involved in the early production of the El Primero decided that he knew better and began hiding away machines in an unused attic of the building. Nine years later there was a surge in the market of mechanical watches and management decided to begin producing the El Primero in quantity again but lacked the machinery to do so. This is where Mr Vermot stepped forward, rather sheepishly I imagine, and admitted to stashing over a ton of materials related to the El Primero in wooden crates. The tragic loss of one of horologies greatest achievements was avoided and eventually Zenith would release a limited edition honoring Mr Vermot's good deed. This piece comes with the original "ladder" style bracelet which I'm not sure whether I'm a fan of or not but obviously increases the value of the watch. In certain areas of the dial there are spots where the piece is showing it's age but overall I really love the fading grey to dark black. The hands all appear to be original and all the lume seems to be in very good condition which is always a bonus. The auction estimate for this piece is 2500 to 3000 GBP. I picked this one out solely just because I like the look of it. Other than imagined historical connections to fictitious Ad Men or the future nuclear family of the Jetsons there isn't a grand horological meaning behind this piece. I just like it and sometimes that's all you need. What is great about sixties designs is how futuristic they were. The sloping lines, the gilt metal and red lacquer all combine to make a beautiful piece that wouldn't look out of place on a desk today as it did back in the sixties. 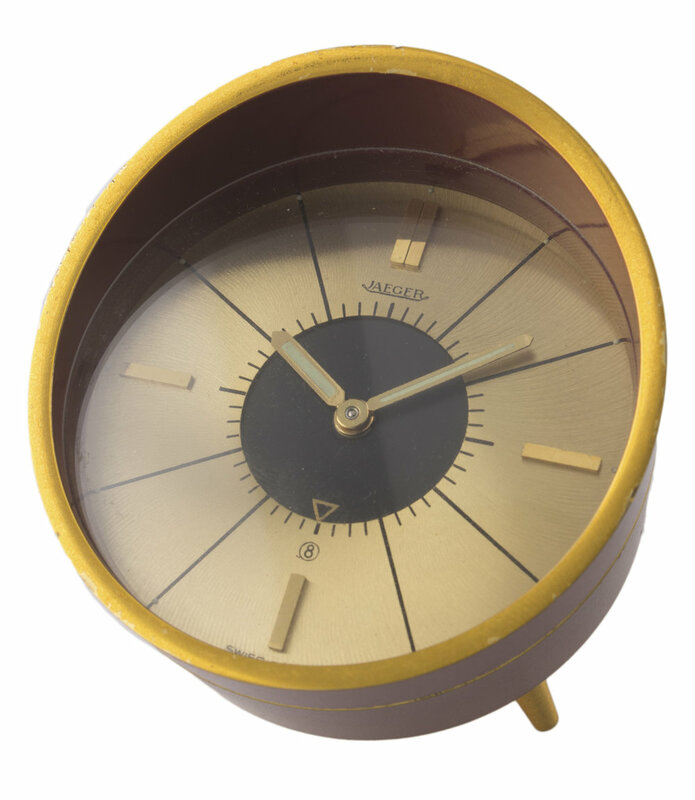 If you look closely at the dial you can see a subtle curved groove pattern running through the gold spiraling towards the inner rotating alarm wheel. Groovey. The auction estimate for this piece is 400 to 500 GBP. If you enjoyed this article then by signing up for the Timepiece Chronicle newsletter you'll get weekly updates on all articles posted to the site.